Beth has a conference in Hallandale Beach/Hollywood next Wednesday through Sunday, and I'm tagging along for the free hotel. She'll mostly be busy during the day, so I'll have four lunches and we'll have three dinners (unless there's something open till 2am or later on Wendesday evening). We'll have a rental car and a GPS, and we aren't too concerned about meal cost or drive time. For dinner, we're interested mostly in seafood (Seafood world? Rustic Inn?) and cuban (Versailles?). We're also thinking about tap tap, but I'm not sure if it'll happen. The recent posts on Michael's Genuine Food make it a candidate for a third dinner. Lunch-wise, I'd really love to get some pastrami and pickles. Almost all of the praise I see in past threads is for the late Rascal House, so I'd really appreciate recommendations along that line. Any other lunch ideas would be much appreciated, too. where to eat in Miami, FL? Michaels Genuine Food in the Miami Design District is. Last edited by gleam on May 8th, 2009, 12:28 pm, edited 1 time in total. Robert is Here, and he's worth the drive. Kennyz wrote: Robert is Here, and he's worth the drive. If you like Avec, don't miss Michael's Genuine. I'm sorry to say, Rascal House is no more. 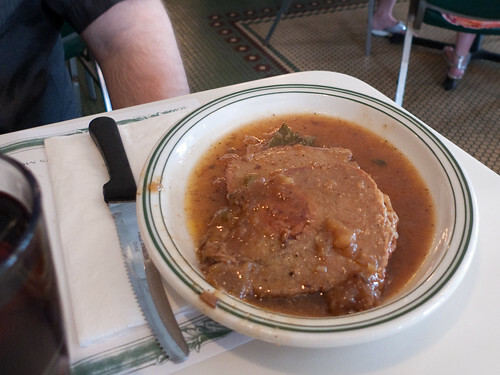 Also, if you're looking for some quick diner food right in the midst of South Beach, 11th Street Diner is good and in an old school chrome diner, though I wouldn't 86 another choice just to eat there. I ate at Michael's Genuine last fall and had a terrific meal. Reservations are essential. Versaille has excellent Cuban food, in a cool, historic building. Thanks for the comments, folks. Is there any deli worth going to now that Rascal House is gone? Or nothing more compelling than Manny's? I third Michael's Genuine. Loved it. gleam wrote: Thanks for the comments, folks. Is there any deli worth going to now that Rascal House is gone? Nope. There's an outpost of the LA based Jerry's in South Beach, but it's vastly overpriced and not all that great...plus they are the ones who purchased Rascal House and ran it into the ground, so I don't patronize them on general principle. Perhaps there's something farther north in Boca, but that's a long drive just for a deli sandwich. jnm123 wrote: Man does not live on the east coast of South Florida alone. This is very true. I'm working on a substantial post about my recent trip to the Tampa Bay area. There is a lot to like about that area, although there are no Jewish delis there to speak of, either. 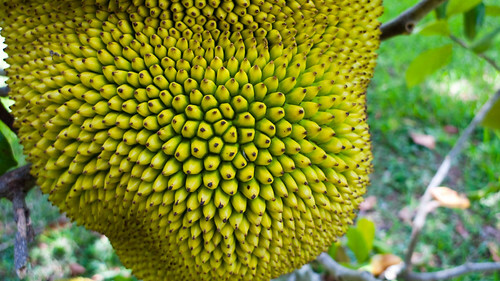 Non-food related, we also made it to Vizcaya and I made it to the fruit and spice park. And, of course, spent some time relaxing pool/beachside. There weren't really any losers among the places we went, but the real highlights for me were Michael's, the pie from Roth's, and Naoe. We were both very happy. 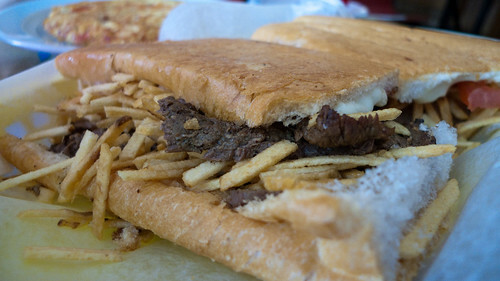 I also now understand why people bemoan the lack of cuban bread in Chicago. The flakiness of the outer layers when pressed was pretty unique, like a combination pie crust/bread. While we were there, we saw more than a couple orders of the daily special -- seafood paella -- going by, and it was an impressive looking dish. Whether it was good, I dunno. Lots of cops, lots of spanish being spoken, and the staff's grasp of English is hit or miss. But, we'd go back if we were in Miami again. Mon-Fri. 6:00 a.m. - 4:00 p.m. Sat. 6:00 a.m. - 2:00 p.m.
We tried to go to Tap Tap for lunch on Sunday, before our flight, but I'd misremembered their hours -- dinner only. We ended up at Le Tub, since it was on the way to the airport and was recommended by a few different people. Coincidentally, like Great Lake, they were the recipient of one of Alan Richman's Best * in America nods, a few years ago, for the burger. It's a nice space, with a cultivated dive atmosphere, on the intercoastal waterway. It's not cheap: $11 gets you a 13 ounce (yeah, seriously) burger, add $0.50 for american or $1 for swiss cheese. $5 for a large fry to share. Anyway, the burger was quite good, tasting a lot like a backyard burger -- simply seasoned, not too tightly packed, and grilled exactly to order. Is it the best burger in America? I don't know, but probably not. That said, if I lived in south florida I'd have this burger again. It was very good. My personal highlight was the hog snapper, a bizarre looking fish that was incredibly delicious. I'd seek out this fish again, for sure. Stone crab was fine, Beth's fried fish (tilapia, wtf) was fine, but the highlight was that hog snapper. Beth's chicken chicharonnes are unshown, but were mediocre. Dried out chunks of fried chicken. The winner of the table was the boliche, which was pretty great. 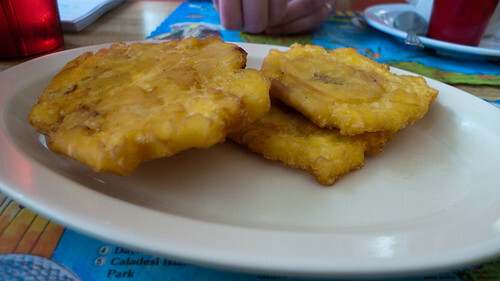 My vaca frita wasn't bad, either. Not bad bagels. Better than anything in the city of chicago, certainly, but probably not quite as good as NYB&B. Nicely chewy, with a crisp outer crust. The place as a whole is a bit of a dive, but they had a wide selection of smoked or cured fishes, and a separate room with all of your deli standards, but I only tried the bagels. I don't have any experience with key lime pie, really, but this was phenomenal. 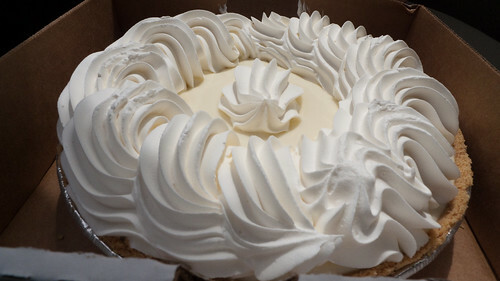 Not too sweet, not too sour, a bright lime taste in both the pie itself and the whipped cream, and a decent graham cracker crust. We ate the whole thing with spoons, out of the box, over the course of about 16 hours. I also made it to Homestead and visited both the fruit and spice park and Robert Is Here. Unfortunately, not much seems to be growing in mid-may, so the selection at both was OK, but not outstanding. I also picked up a strawberry/key lime milkshake at Robert Is Here, which was actually a perfectly tasty strawberry/key lime smoothie. Coincidentally, the 2009 Redland Orchid Festival was going on at the fruit and spice park while I was there, so there were several dozen orchid vendors from as far away as thailand and venezuela selling their plants. 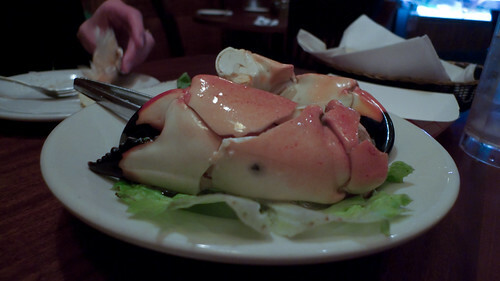 In two days I'll be in South Florida, and Joe's Stone Crab and a bar mitzvah aside, I'm not sure where to eat. Any help is appreciated. I've used linked threads (including my own vital info) as starting places, but I feel somewhat adrift. Not the least because of no Rascal House safety valve. Also, oddly, it seems like all of a sudden, certain S. Florida favs like cuban and Jamaican are now practically around the corner from me. And where there was once nothing close, we now have some decent S. American chicken places in Chicago. There is even an Israeli place, Mizrahi, that is like something I used to get only in Florida. How to divvy up my chowing? Finally, we will be in Broward, which is really not limiting per se, but it is limiting in some ways. After all, my first need is a chivito and the only chivito's I know is on Collins in Miami Beach. I love Miami River seafood. Anything equivalent up north a bit or if I do take the long trek, any ideas on what's good now. Anything that can replace Rascal House? And, obviously (for me), eat local/locavore focused places. For Broward my go to's are Pelegrino's in Deerfield Beach (the maternal side of the Rao family). Frutta di mare, sauteed chix livers and porkchop w/peppers and egg are all very good. Amarone is reasonably priced as well. Cafe Martorano on Oakland Park just e of the intercoastal. Philly Ital American. The chef djs from the line w/the Godfather playing on monitors. When Freddo gets shot in the rowboat, they turn it up real loud. Used to have a framed copy of the front pg of the Philly Enquirer of the chef's father being led away by cops on a RICO charge in the 60's over the urinal in the bathroom. The pinky ring capital of S.Fla. Huge portions. Great pasta and scampi bread. No menu, they charge whatever they want. Quite expensive and quite a scene. Michael's Genuine Food in the design district is worth a detour. There's a thread on it. Tap Tap in S Beach is among my favorite restaurants ever. The place works on so many levels, food, music, ambiance, the definitive mojito. Akra, goat tidbits, spinach w/coconut, pumpkin soup, abalone or whole roasted fish, beignets. More if you're interested. 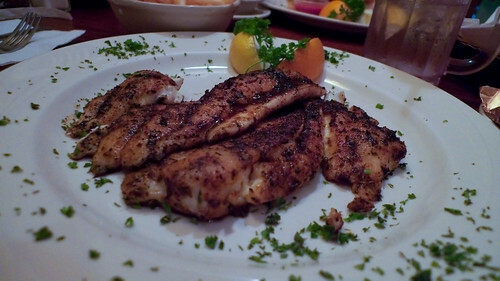 For the best fish, going a bit north (and well worth it) is Captain Charlie's Reef Grill in Juno Beach. Lots of day boat fish. Huge menu. Pompano, hog snapper, yellow tail, grouper cheeks, great food done well, reasonably priced. The owner is kind of a mentor to me, a great restauranteur. In season, these are all busy. Expect to wait even w/a reservation. Thanks for the tips Alan. I just found out that we will be staying not in Hollywood but Aventura, which will mean much good bagels within reach. I'd love some more hot tips if anyone has them. Rob - really good Haitian in Broward at a tiny, divey, true family-run place with the cook's little kids running all over the place, and the older kids sitting at a table in the back doing homework. Tassot Cabrit had tender, braised goat meat on the inside and a crisp, deep fried exterior. Great stuff. 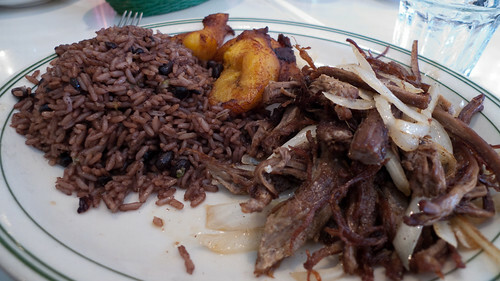 Kennyz wrote: Rob - really good Haitian in Broward at a tiny, divey, true family-run place with the cook's little kids running all over the place, and the older kids sitting at a table in the back doing homework. Tassot Cabrit had tender, braised goat meat on the inside and a crisp, deep fried exterior. Great stuff. Thanks Kenny, that's the kinda stuff I'm seeking. Vital Information wrote: Thanks for the tips Alan. I just found out that we will be staying not in Hollywood but Aventura, which will mean much good bagels within reach. I was in Miami over Thanksgiving and had a chance to catch up with a friend of mine who just opened a burger place in Aventura called Heavy Burger. Chad is a 20+ year vet of the Miami restaurant scene and, while I didnt have time to make it up to Heavy Burger myself, I liked what he described. Fresh cut fries, beef ground fresh everyday. Anyway, he received a nice write up from the Miami Herald and if you are in the area it is worth a try. It looks like a Kuma's clone (That's not a bad thing). There is a place in South Miami a friend of mine knows the owner's called Burger And Beer Joint. As soon as I went there last year all I could think of was these guys came to Chicago and ripped off Kuma's and Rockit! The logo B&B is like a Tribal tattoo like ROCKIT's logo. Instead of band names all the burger's are named after songs, Stairway to Heaven, Fly like an Eagle etc. I guess imitation is the best form of flattery! stevez wrote: It looks like a Kuma's clone (That's not a bad thing). I asked Chad about that when we met for a drink last month. He is originally from Chicago and has heard of Kuma's but has never been. I agree a Kuma's clone would not be a bad thing. Anyway, he is a great guy and deserves a lot of success. BAH to all the people who have ever been or are going to S. Florida. I'm fricken freezing! razbry wrote: BAH to all the people who have ever been or are going to S. Florida. I'm fricken freezing! Ha! It was pretty darn cold last weekend, into the 40's! I'll post some updated tips when I have a bit of time. Eating in S. Florida continues to be mostly very good. ...Much more (I believe) than even Cuban, it is the deli. Time and progress, however, have removed the greatest from our reach. A journey down Collins Avenue showed a vacant lot where Wolfie's once reigned and the home of the greatest in the land, the Rascal, has been sadly converted to something called Epicurean. Our beloved North Miami Beach staple, Bagel Bar had been reconfigured and re-occupied by something called Roasters and Toasters, which seemed to be avoided by all just on principle. Still, in the alter kocker land that is Aventura, there are places to be found. On this trip, we hit Mo's Bagels. Mo's had about all I wanted in a S. Florida bagel shop/deli: gratis little danish, here something called cheesecake souffle, which was like the inside of a cheese blintz fried up; hand sliced "real" lox, comforting staff, deli look and feel. What it did not have was outstanding food. We all found the corned beef hash bland. The whitefish salad came out a bit too sweet, and the bagels were too fat and soft. 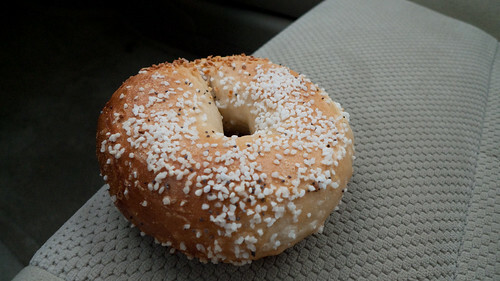 Maybe your tip should be to see how Bagel Cove up the street compares. ...The retirement condo ghetto of Aventura ends abruptly, giving way to a stretch of ultra divey motels, 24 hour open air laundromats and other assorted riff-raffaria's. Of course Federal Highway is not the multi-culti eating zone that is St. Rt 7/US 441, but we'll get to that in a moment. Instead, it is a place for Travis MacGee era Florida. Who cannot imagine him knocking back a few beers with a grouper sandwich, wings and some curly fries on the side at Tark's. Would he mind that the grouper now comes from Asia? Eating fried fish and other seafood at Tark's is like eating hot dogs at Wrigley. It just tastes better because you are there. A little further up the street is Jaxson's. It is highly not sleazy in any way, but rather much frozen in time (except for the prices). It is not just nostalgic in decor and feel the way the way that Walt Disney felt nostalgic when he built his first park, it is nostalgic in the way it lacks the tiniest bit of irony. Eat your very large fountain creations damnit. And man are they large. One of my daughters got an ice cream float, where the float part was not a glass but a pitcher. The chocolate chips are especially huge, a house speciality. The prices, actually, are not outrageous because items can (and should) be split. Do not, however, go expecting something like the museum parlor at Science & Industry. The ice cream itself is outstanding. ...It aint Westminster chicken, it's Westmoreland style chicken. All the time we were down in Florida, the older daughter was gripin' she wanted Westminster fried chicken. Now, I had mentioned it at some point as a good food memory from our last visit, but I think she just was in love with the notion of blank, fried chicken. As in fried chicken's good, but when you make it WESTMINSTER fried chicken, well. And why did I think it was Westminster fried chicken. I guess I had not paid too close attention to the Aunt I's menu. Westminster, with that English air, just sounded Jamaican to me. It turns out that it was, is Westmoreland fried chicken that Aunt I serves, that is chicken fried and then topped with jerk gravy. And after telling you all that, I'll tell you this, Aunt I's on Sunday afternoon, when nearly all the fare of the day was sold out, and the fish tasted as it should have been market sold out a few days earlier, it did not really mark well to memory. ...Not every thing we tried at La Estancia Argentia tasted great. It seems, for instance, that Argentines have a taste for two Manischewitz style macroons smacked together with a slathering of dulce de leche. I mean it looked good at first. Still, a lot of the baked goods tasted a lot better, especially something that looked like a pinched pancake with dulce de leche on one end and cream on the other. What were these called. Well, that's about the whole point of this place. You have no idea. You have no idea that you're in the USA. Everyone's talking in that Italian accented version of Spanish that is Argentine**. The place is filled with so much stuff you have never seen, pastries and empanadas and finger sandwiches, and it does not make a hell of a lot of difference what does and does not taste good because a plane ride down there costs a hell of a lot more. ...I'm saving the best for last because as a Jew, I'm preternaturally attracted to anything Israeli. No matter your political or other beliefs, however, you will like this place. Our standard for Israeli food in this country used to be Pita Plus in Aventura. Then, finally, Mizrahi opened in Highland Park, and I'm telling you, we had something here pretty darn close. Close. Then, we got taken to Etzel Itzik on Dixie Highway in Aventura. This blog post excellently places the international-ness of the place (I love the line about the phone ring). You sit down. You get six or so Israeli salads. It all tastes biblically good, even fusilli pasta salad. OK, the seven salads: two cabbage, beets, pasta, chick pea, corn + pickles and olives. I'm telling ya, everything on our table I loved from grease-less thin "schnitzel" to spicy mergez to something we did not know before called sabich--egg and hummous and a whole scallion and some more in that Israeli pita which, I have to say, is the best pita. And we loved it so much we had to go back for the Israeli breakfast a few days later. It's not a breakfast buffet, too bad, but mostly things we had to say, "what's that," and what's that was variations of beans and hummous. But it's all good. Except for the tomatoes. No place has worse tomatoes than Florida. ...It was not all good. Le Tub was supposed to be a burger high point, but it rather sucked. There's a few other places, here and there, places you would not care about as a traveler. Regardless of a clunker or two, you will eat well in S. Florida with these tips. **I do not really know this for sure, but I remember once talking with a Colombian cab driver, and he complained about the Italian accented voices (and airs) of the Argentines. Spent a night in Miami last weekend and ate well(what a surprise). Lunch was at Garcia's, a casual cuban seafood place on the intracoastal. There's a nice deck upstairs looking over the water. 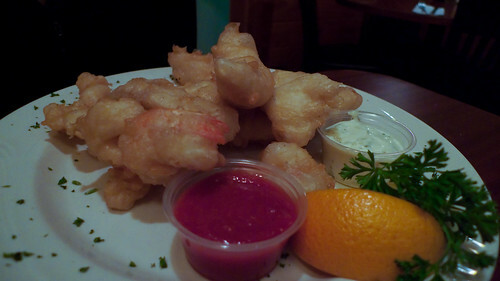 We had a basket of perfectly fried oysters and a delicious grilled grouper sandwich. Dinner was at Michy's, a Michelle Bernstein restaurant. 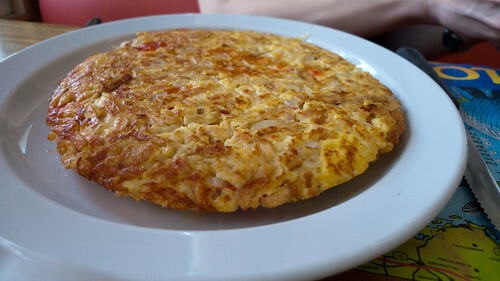 Most dishes are offered in half and full portions. Sorry no pictures but every dish was a winner, including duck confit with shaved brussels sprouts salad and mustard vinaigrette, crispy pork belly with pork jowl tortellini and parmesan ham hock broth, sweetbreads milanesa with cipollini opnions, apples, black eyed peas bacon, and cider gastrique, seared stone bass with wild mushroom salsify ragout and parsley veloute, and chupe de mariscos with fish, clams, mussels, scallops, shrimp, sofrito, and crispy rice cakes. Lunch on the way home was in North Miami at a great Peruvian restaurant called El Gran Inka, serving wonderful ceviche, tiradito, baked scallops served on their shell with parmesan gratin, and papa a la huancaina. Staying at The Mondrian in Miami Beach July 1st-July 4th. Rented a car. So far I've made dinner reservations at Michy's, Sra. Martinez, and Michael's Genuine Food & Drink. Has anyone had cocktails at Setai? Any lunch recommendations or alternative dinner places I should consider? Thanks for any suggestions/advice! We ate at Michy's a few months ago and loved it. Michael's is another great choice. Garcia's is a nice spot for lunch on the Miami River with good views and fresh seafood. Another spot for lunch could be some Cuban food at Versailles. Gonna be staying 3 nights in Hollywood next week, intend to spend at least one day in SoBe....any updates for this thread? Will be with my 20 year old daughter, really hope to find good Cuban and maybe some great seafood. Don't want fancy/dressy/super pricey, hope to kind of park once and stay walking distance if possible. Haven't been in Miami in 30 years so any starting point would be great. Thanks, LTHers always do right by me beyond Chicagoland!